You'll need a lot of food when you are out in the mountains. We prefer good tasting and plenty of food instead of a light back pack. That's why we bring food that are heavier than the dried food you buy at the drugstore. If you walk the whole day it's very important to fill up with energy for your body so you stay healthy. 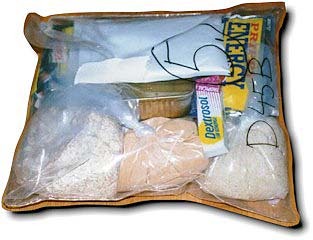 We pack the food in day bags which are numbered with a day number. Then it's easy to vary the food. If you are planning a longer hike always take food for one extra day. We have choosen to divede the food in these groups. Breakfast - What we eat for breakfast. Lunch - This is what we eat for lunch when we have a longer break. Dinner - After a hard day of walking you need to charge your batteries. Evening meal - An extra meal will be fine before bedtime. Extra - Sometimes you need some extra energy. We also have some recipes of food you can prepare at home and live like kings in the mountains. Read about how you make our famous dried forcedmeat sauce.